At the end of January 2018, from 26th to 28th, the 4th edition of the Small size days will take place. A simple but special event happening at the same time in so many countries worldwide, testifying the importance and the attention paid to early years. Young children are so loved, so protected and, at the same time, so underrated. What does a 10-month-old understand and what emotions can a 2-year-old girl feel? Do they have complex thoughts and feelings? Or do they have just instinctive and immediate reactions – which we welcome with a condescending smile, amazed at their “innocence”? Speaking of children, we should be careful with the use of the word “innocence”, and avoid misunderstandings. It reeks of lack of awareness, futility, inconsistency. In this world, children are innocent because they have just started out; but even the youngest ones are definitely not angels. They are thinking human beings; they can feel and make others feel. They are not always innocent, because the beauty of ambivalence belongs to mankind: being innocent and guilty at the same time, dark and light, open and concealed, here and elsewhere. We cannot measure the quality of a thought or a feeling in kilos or centimetres, and yet, do we really respect the thoughts of a teenager, or those of an 8-year-old or a of toddler who learned to walk just yesterday? “Children account for a large percentage of mankind, population, nation, people, fellow citizen. They are our faithful friends. Are, were and will be.” So Korczak said, and he knew children very well. Children and young people are here today; they are full citizens of our present, travel companions, regardless of their country of residence and traditional culture. With their amazing unpredictability, they keep reminding us that all we have to do is to listen. Or we will lose them. And we would lose fragments of an incredibly logical and analogical thinking that they are constantly capable to offer us – provided that we observe and listen to them with respect and with the curiosity for what we do not know. Which is not only their world, but the way they perceive the world. This perceptive quality belongs to all the children of the world. What changes is what they experience in the various cultures, but what they need from and ask to the adult world remains the same. In particular, their need to know what the world is remains the same. And they need to know all its aspects, even the ones we do not think important for them, the ones we believe are exclusive to the adult world. Children observe the adult world constantly, because it is by watching and listening to the adults that they learn and build their knowledge, their view of the world. When we speak about what we can offer children, we should remember that, while we ask ourselves what to do, they keep their eyes fixed on us, and by studying us, they learn. So, while being aware of their needs, we should keep asking ourselves how we can take care of them with our art, remembering that children simply ask us to be available, pay attention and listen. To be there. Children look at the world with eyes hungry for knowledge and empathy. Eyes open wide, eager to take in every detail and be amazed. “Wide eyes”. Wide eyes, another Small size project, will be celebrating the conclusion of the European project Small Size – Performing Arts for Early years, in Galway, Ireland, from 1 to 4 February next year. 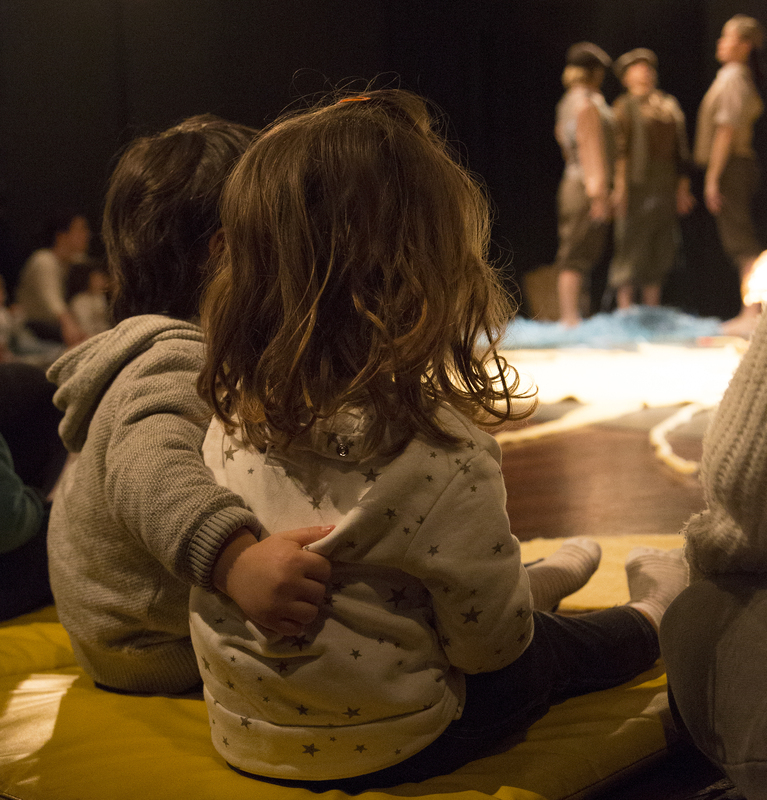 To join us in Galway can be an occasion to learn more about theatre for very young children. “Wide eyes”. We like to think that the adults’ eyes are the same, especially the eyes of the artists. Eyes wide open to what’s around us, and able to look far to understand and feel. Perhaps that’s not how it works, but let us not forget the importance of the intention, and, on the other hand, the willingness of the many artists who – just like all our friends of Small Size – continue to take care of children with their art. And the many experiences that Small size has collected during their journey with the little ones are proof of it. Young children have their own cultural dimension and their own way of perceiving and feeling, as well as their own pace. They think in a complex way and feel in ways we don’t know yet. We might not understand them, but with them we can establish strong sensory-based relationships. Different sensitivities gather together in the artistic experience. To share our own sensitivity, even for 30 minutes, is something extraordinary. But when the meeting “works”, when artists really succeed in taking care of the children with their art, then, during those 30 minutes, it is possible to see the wide eyes, which become a tale within a tale. Little children have a unique ability to convey the intensity of their amazement, like nobody else does. Glances and postures entwine with the artists’ actions, enriching the subtle connection that comes to life and ends in the course of an artistic experience. And this way of living and making art cannot have boundaries, it must move across national borders, because Small size is a network, and networks do move across borders – all borders – in a transnational, multi-cultural and multi-generational dimension that could be the future of ASSITEJ.